Bosham Capital Advisors (BCA), Independent Investment, Advisory and Capital Markets specialists is pleased to announce that it has completed a £4.3m Series B round for Diamond Manufacturers (t/a VASHI). 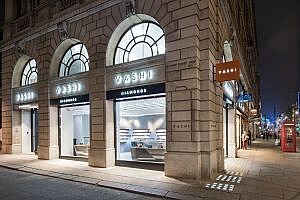 VASHI has been selling diamond jewellery predominantly online and from a store on Grafton Street. The opening of a new flagship store in the heart of London on Piccadilly, represents significant growth in the business. This was the second EIS-eligible financing round that BCA has managed for VASHI over the last 18 months, with a high level of follow on commitments from the original investors. Part of the proceeds from this round have been used to finance the opening of the new flagship VASHI store at 46 Piccadilly which officially opened on 26th September. This entry was posted in News on 26th September 2017 by adminBosham98.